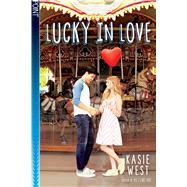 Kasie West is the author of several YA novels, including The Distance Between Us, On the Fence, The Fill-in Boyfriend, P.S. I Like You, Lucky in Love, and By Your Side. Her books have been named as ALA Quick Picks for Reluctant Readers and as YALSA Best Books for Young Adults. Kasie lives in Fresno, California, with her family, and you can visit her online at www.kasiewest.com.